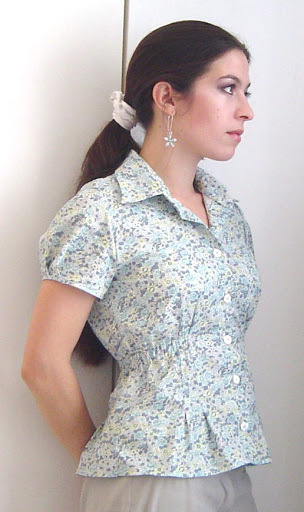 I traced this pattern and cut out the blouse at my parents’ country house last month; but I sewed it only this week. It may appear a bit outdated, given it’s now autumn in France (and a cold one at that). I don’t care. I just had to make this light, summery little thing – and live summer through it, vicariously, and belatedly. My Mom gave me the fabric a couple of Christmases ago. You know how it is with fabrics loved ones give you – either you make something from them straight away, or they start daunting you. What pattern would be worth this meaningful fabric, we wonder? How may I best tell the giver how much I appreciated his or her gift? I long thought this fabric was meant for a dress. You know, the full-skirted, flowing, summery kind. It decided otherwise after I packed it along with a number of patterns – and the June issue of BWOF. 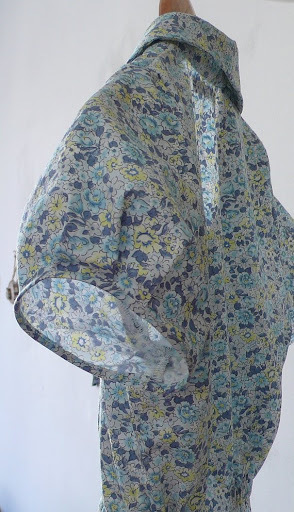 I must confess to loving everything about it – the blue, of course; the fabric’s lightness, which is reminiscent of Liberty lawn; but also, the tucks at the waist, front and back; the elastic shirring; the adorable semi-raglan, bias-bound puff sleeves. This is an instance when I actually like the French sewing vocabulary better. “Bias-bound sleeves” translates to “manches gansées de biais”. I just love “gansées” – don’t you? A word of warning about the sleeves, though: there is very little ease at the armscye and the bust may therefore end up a little crushed when moving the arms. I remedied that by adding as much from the seam allowance as I could into the armscye, and sewing the seam with a tiny SA (it is only 5 mm). It just about works, although a little bit more ease there would probably be better. It’s gorgeous Isabelle 🙂 So very “you”! I agree, this blouse is “you”. Perfection. 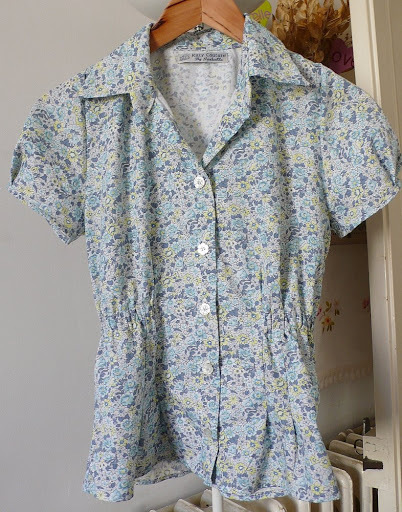 It is the perfect little summer shirt…but it seems to me that it could go into fall with a nice cardigan over it! It’s wonderful to see you posting again, I was happy to read that you got your big work done, congratulations! I love the blouse you made and everything you’ve shown recently. It almost makes me want to start sewing something for me again… Have a happy new week! Excellent pairing of fabric and pattern! 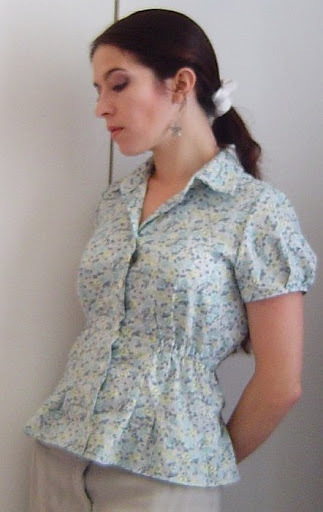 You’ve inspired me to move this blouse up on my must-sew-list. What a cute little summer blouse! The fabric and pattern seem so well suited for each other. That blouse is so gorgeous and romantic on you. Beautiful! This is such a beautiful blouse! I love the fabric too. gorgeous blouse. love everything about it….color, style, fit. definitely suits you well. i think you can still get a few more weeks out of it, paired with a little cardigan. It’s always a responsibility to find the right garment for a “special” fabric like that, and you did well. The blouse is beautiful on you, and I agree, you could definitely wear it under a jacket or cardigan if your office has tropical heating. So glad you’re getting time to sew again. It’s truly great therapy when you’re feeling overworked and overwhelmed by the world outside your sewing space. It is completely “you” in its sweetenss. Lovely job, friend. Lovely…and it looks just in season from here! Beautiful blouse, Isabelle, I agree this blouse is so you. You look lovely in your beautiful blouse. What a pretty summer blouse! You look lovely in it! So pretty, it suits you very well. I don’t why you can’t celebrate summer just a little longer – you’ve worked hard this summer! Enjoy the blouse. De-lurking… I enjoy reading your blog. I hope you get many chances to wear the top-it’s beautiful. I wasn’t sure how I’d feel about the elastication on the sides of that blouse, but I think now I’m convinced. Of course, it’s a little late for it here, too. Boo. A beautiful top, so romantic in that floral. We had been without electricity for over one week, which meant no blog reading or commenting. I did get a glance at your updates on the computer at work, but I don’t like to use my passwords there. Finally I am back and trying desperatley to catch up. I love the new blouses and I am very glad to be “reunited” with my sewing machine now that electricity has been restored. 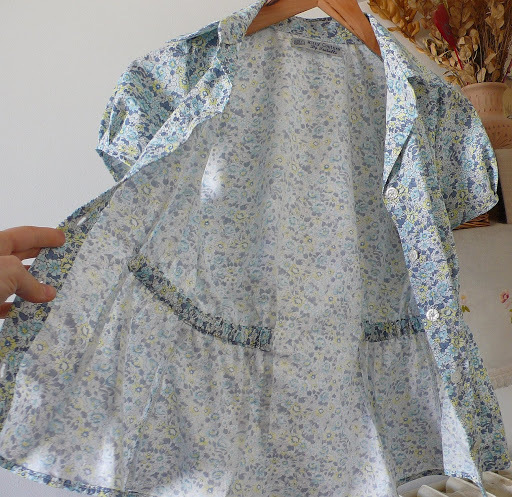 During the time off I did work on some tiny hand-sewing of circa 1900 doll dresses. I am reading a book that shows the early works of Coco Chanel. I love her 1914-1918 collections. I was not aware of these before as in the US we only know of her famous suits of the 1950s/1960s.Hope to catch up on reading and then update my blog too. Glad to see you back. Very nice shirt and the fabric looks so light and fresh. Perfect pairing of fabric and pattern. How pretty! Perfect fabric too! Very pretty blouse! I’ve been thinking of making this top myself so thanks for the tips about the sleeves. Very pretty blouse and it fits you perfect. That’s a lovely blouse and it’s so you! I love the fabric and the model! You did a fabulous job! I have some wonderful fabric from Metro Textiles in New York and this blouse is earmarked to make in the near future. I have to agree with the sleeve issue you discussed in other Burda shirts I’ve made, and will use my sloper to remedy this. Would you say overall you are still happy with this? It looks beautiful!